Vesk doubled over very satisfyingly, the breath seemingly driven from him. Even the fact that this was an obvious case of playacting on his part didn’t dull the appreciative smiles it brought from several of those present. Trissiny didn’t smile, simply turning her back on him and resuming what had been her original course. She didn’t hug Gabriel, after all, but reached out to grab him by both shoulders, and only then drew in a deep breath and blew it out in relief, as if unwilling to believe he was actually there until she had her hands on him. “We had the easy half of the bargain, don’t forget,” Toby said, smiling as he strode up. He did hug Gabriel, and was hugged back. Trissiny took a step back, smiling at the two of them for the long moment they shared. Behind them, Izara blinked, a gesture so slow it verged on simply closing her eyes, and a serene smile spread across her thin features. Around her, the air seemed to lighten. Xyraadi glanced at Agasti and then Toby before her eyes returned to Trissiny, her lips pressed into a frightened line. She managed a terse nod of her crested head and a small noise deep within her throat. “I…” The khelminash swallowed once, nodding again. Slowly, the demon reached out and placed her slender hand in the paladin’s grip. Trissiny closed her gloved fingers gently around Xyraadi’s and squeezed once, smiling at her, before letting go. “There truly are wonders in the world,” Xyraadi said, herself sounding awed. “You are too kind,” she said, clearly mystified, but placed her hand in his outstretched fingers next. Agasti didn’t offer his grip in the same position as Trissiny’s, but gracefully lifted her hand and brushed his lips lightly across her knuckles. Trissiny pivoted and rammed her fist in a precise uppercut into his solar plexus, bending him over again. This time he staggered to one side and his lute fell to the ground with a sad, discordant little plonk. Trissiny turned to him again and he took two circumspect steps to the left, his lute swinging around to hover behind him while plucking an offended little arpeggio. “You have got some nerve,” Trissiny spat. 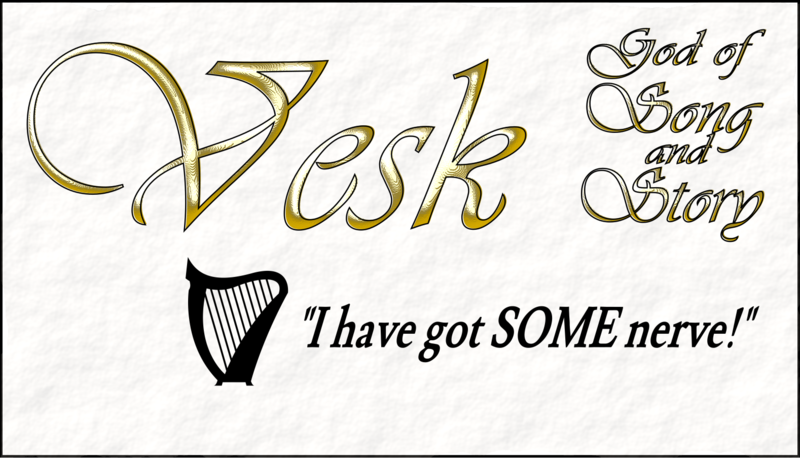 “Indeed, you might say that’s my calling card!” Vesk said brightly, flicking a hand in her direction. A small piece of thick paper flew from his fingers, heading right for her face with the speed and precision of a paper glider, causing her to catch it purely by reflex. Trissiny thus found herself holding an actual calling card. “Oh, so it’s only okay when you do it?” Gabriel muttered, but obligingly reached into his pocket. Toby didn’t bother to comment, simply producing the conjoined first two pieces of the key they had gathered. Vesk reached out with both hands, almost reverently taking the objects from them. Slowly, with a solemnity actively contrasted by Trissiny flinging his card to the ground in disgust, he brought them together. The mithril fragment Gabriel had snagged from the temple wouldn’t have been taken for the teeth of a key on its own. Flat on one end, save for small indentations which caused it to fit neatly into the markings on the side of Gretchen’s Dowry, its other end was an irregular pattern of jagged points and angles, a thin lip of some glossy black material like obsidian emerging to resemble the edge of a serrated blade. It attached neatly to the others, though, and the thing in the god’s hand did indeed have the aspect of a large, old-fashioned key. The shape was evocative, if the resemblance was not precise. Vesk held it out before them on his outstretched palm. “Especially since you as good as sold us to Elilial to do it,” Toby added, staring flatly at the god of bards. Trissiny strode swiftly through the center of the group, aiming another jab with her right fist at his midsection. Vesk reflexively ducked and retreated, bending his body to evade the blow and in the process bringing his head down and forward, which put it right within range of her other hand. He evaded the feint, but she slapped him upside the noggin with her shield. Nobody paid the god the slightest attention as he rolled on the ground, clutching his skull and groaning melodramatically. Agasti turned to the still-nervous Xyraadi, bowing courteously to her again. There was a momentary pause. Vesk, still slumped on the ground, grinned hugely and opened his mouth, but closed it when fixed by a glare from Izara. Instantaneous travel by the auspices of a god wasn’t very much like being teleported around by Tellwyrn. There was less sensation, and not even the noise of displaced air. Vesk’s method was also a whole level more sophisticated, given how he arranged them mid-transit. The four of them had vanished from the sunny hillside below the Wyrnrange after saying their farewells to the others, and reappeared in darkness, in what seemed to be a ruined temple. It was hard to tell as they couldn’t see beyond the tiny island of firelight in which they found themselves, and anyway were more distracted by the fire and their own positions. They were seated on fallen hunks of masonry surrounding the flames, as if they’d been there for hours in conversation. Even their eyes were already adjusted to the light. Silence answered him. Then Trissiny heaved an annoyed sigh. “Where are we?” Trissiny demanded. He paused, likely just for effect, and in that moment there came a soft rustle, practically impossible to discern above the faint crackling of the fire. Then it came again, louder, and clearly from the darkness beyond them. Trissiny and Gabriel both drew weapons, shifting on their seats to peer around. “Come on, Gabe, don’t you think elves who live deep underground know how to dig? If all the tunnels were closed off, they’d just bore their own, and then they might pop up anywhere at all. No, there are paths left theoretically open, which is much easier than tunneling even if the Themynrites block them off. And yes, after eight thousand years, they could probably have gotten out faster if they had devoted themselves to excavating, but you have to understand how Scyllithenes think. Doing lots and lots of hard work is just plain not on the table, not when the alternative is committing horrific violence against those they see as enemies. So obsessive are they on this point that no major incursions of deep drow have ever tunneled all the way to the surface, at least not under their own power. That’s an excellent example of why they cannot be allowed to have access to the surface kingdoms. “Okay, what is that?” Gabriel asked somewhat shrilly, getting to his feet. The other two did likewise, turning to stare out into the black. The rustling noises were intermittent still, but clearly came from all sides now. “These questions rise in every Themynrite city, of course,” Vesk continued, ignoring them, “and are suppressed. But in Irivoss, the suppression…failed. Eventually the unthinkable and unacceptable occurred: complete penetration from both sides. The slightest trickle of deep drow sneaking through to the surface, and humans journeying beyond the lower gates to learn from the Scyllithenes. The Irivoi had failed in their sacred charge. And so, Themynra commanded them to die. Those still loyal and obedient, she ordered to end themselves and their entire society. Light bloomed, clean, white light. It rose first from crystals embedded in the pillars of the temple above them, rising to illuminate the ruined splendor. Then it spread outward, ancient magics long dormant coming to life again at the god’s will, and crystals began to gleam throughout the city. They illuminated the ruin of crushed and fallen structures as well as the majesty of beautiful stonework still standing, rising and spreading ever outward until they revealed the shape of lost Irivoss, its half-moon arc around the black surface of a subterranean lake. The temple appeared to be at the highest point of the city, overlooking it all and built right against the wall of its massive cavern. None of them appreciated the view. The spiders were everywhere. They had clearly been creeping closer ever since the intruders had arrived, and were not arrayed just beyond what had been the rim of the firelight. Ranging from the size of wolves to a few specimens bigger than oxen, their carapaces glistened and sparkled in the sudden illumination, apparently encrusted with gems. As the light rose, they swiftly retreated. A veritable tide of them hurried back down the sides of the temple and those thronging the ruined streets scuttled away into the shelter of buildings, tunnels, and alleys. “Dreadcrawlers do not enjoy light,” Vesk said with a casual shrug. “That and the fact that they’re rubbish at digging are the saving graces of this whole mess. They can’t get to the surface, and wouldn’t if they could. It was humans and dwarves who collapsed the tunnels and did their best to bury and forget the entrance to Irivoss after the priestesses did this to their people. Now, nobody on the surface even remembers this city, and so much the better. The dreadcrawlers, you see, are only sort of alive. There was necromancy involved in their creation; they’re basically walking husks, made almost entirely of chitin with very few squishy parts, and exceedingly durable against physical damage. Practically immune to magic, as well. They’re also as immortal as the drow they once were, and don’t strictly need to eat. They can eat, and will eagerly do so, but that’s only part of their breeding cycle. Given meat to polish off, they’ll make more dreadcrawlers. Now, in the rekindled light, they could see that the entire city practically sparkled with enormous spider webs. He turned and paced forward, along the half-fallen colonnade of the main temple space, till he came to the top of a wide flight of stairs leading down into the spider-infested city. Silently, they followed him. Abruptly, he turned to face them. “Sorry,” he said, rather weakly, as he straightened up under his own power again. “We can’t leave!” Trissiny burst out. “Gabriel isn’t a warlock,” Toby objected. Toby had turned to stare again at the empty patch of blasted reddish stone where the temple—and Gabriel—had been minutes ago, but after Agasti’s voice trailed off, he shifted his attention back to the warlock, frowning impatiently. In the next moment, his frown deepened, now in real worry. Agasti was not moving at all. In fact, he didn’t appear to be breathing. Neither, Toby immediately discovered, was Trissiny. She stood as if immobilized in ice, as did the two demons. The nearby birds and insects had already been silenced by the presence of so many demons, but he realized now that even the grass, wilted as it was by its brief trip to Hell, was completely solidified, disturbed by neither wind nor gravity. In fact, there was no wind, either. The whole world appeared to have abruptly stopped. “What conversation?” he demanded, forgetting to speak with proper respect. He felt entirely thrown from his equilibrium, and somehow frayed. Toby’s whole life was about control, serenity, and balance, and at that moment he felt as if every one of those things had been stripped from him, leaving him blindly reacting to events in exactly the way his teachers had all stressed that he should never do. Still worse, there was a significant and undeniable part of him which reveled in the freedom, even despite the pain of losing Gabriel. Izara finally turned her attention on him fully, and her expression was unreadable. Nothing about her seemed particularly divine, apart from having apparently suspended them in time; she was just a somewhat gawkish young woman with frizzy hair. If he hadn’t seen her the night before Toby would probably not have recognized her at all. “You never have learned to find a middle road,” she said after a thoughtful pause. “What is wrong with you? !” he exploded. “Then why are you here lecturing me and not Omnu?” he shot back, practically tasting his pulse pounding on the back of his tongue. Toby felt heady, even a little dizzy, but still there was that strange exuberance. Toby felt that inexplicable sensation rising, the strange fusion of fury and uncertainty that had so thrown him off his keel but felt so satisfying. For just a moment, he was so tempted to just punch her that his arm actually twitched. It was hard to say which did more to shock him back into a semblance of self-control: the sheer horrible depravity of striking someone just out of his own ill temper, or the incredible stupidity of trying that on a goddess. Instead, his years of training finally began to resurface, and he breathed. In, out, three times each, until the emotion began to ebb, the clarity to resurface. “What are you doing?” he asked at last, narrowing his eyes. Izara let that hang for a moment while he stared, just wearing that mysterious little smile. Only when he finally drew breath to speak again did she continue, cutting him off. “I listen to Professor Ezzaniel,” Toby protested, hearing the defensiveness in his own voice and hating it. The creeping euphoria had all faded from him now, leaving him only off-balance and unfocused, confused. He couldn’t find anything to say. Izara watched him for a moment, then continued. Toby sat down in the grass, no longer able to look her in the eye. She just pressed inexorably on. Izara heaved a sigh, then stepped over to sink down into the withered grass beside him. There, she leaned comfortingly against his shoulder. There was still no discernible aura of power about her; it might have been any slightly-built young woman pressed to his side. Somehow, that mundane warmth seemed much more comforting. “I don’t understand what you’re telling me,” he said weakly. Toby stared up at Trissiny, standing frozen in time before him. Really studying her, in a way he rarely did anymore. It was funny, how quickly one could grow to take people for granted, once one was used to having them around. He remembered Trissiny in their earliest days at the University, the uncertainty and vulnerability she had displayed, the bluster with which she covered it, the rigid and frankly bigoted shades to the conviction that powered her. Now, in armor again, he could still see the contrast. She stood square and tall, but without any of the tension and stiffness she used to carry. Her expression was intent and pensive as she listened to Mortimer, but underneath the focus there was calm, totally unlike her borderline fanaticism of just two years ago. It was all right there, subtle but so plain when he really looked, even when she was suspended like a sculpture. Trissiny had grown so much. They all had. Gabriel and Fross were practically different people. Juniper was in the grip of so many transitions it was hard to say how she might end up. He wasn’t sure whether he had only recently come to detect the care and compassion in Ruda, or the warmth and humor in Shaeine, or whether they had themselves grown more comfortable in those traits. Even Teal, despite Izara’s criticism, was slowly evolving into her own woman despite the pressures upon her. Could he say the same? Had he really changed? Looking back, Toby found, to his shame, that he could see little that was new in himself except his ever-growing uncertainty. Izara was right: he did nothing but react. Without a plan, and without focus, just constantly wandering about trying to be a calming presence wherever he was. He knew without self-aggrandizement that he had had a positive influence on his friends. But to the world at large? What could he really achieve by just being the nice guy? How many people could that help? Chang Zhi was spoken of with tremendous reverence within Omnu’s faith, as perhaps the perfect spiritual role model. When he pressed himself, though, Toby couldn’t come up with anything of significance that she had actually accomplished. “I’m such an idiot,” he said aloud. Without recrimination or angst; it was just an observation. “You’re no more of one than someone your age should expect to be,” Izara replied, a note of humor lightening her voice. She grinned at him, and then suddenly the air moved again. “…which will be the trickiest initial part, as—oh!” Agasti’s voice cut off mid-explanation for the second time to Toby’s ears, though it was the first to everyone else’s. He, Trissiny, and the two revenants both turned to Izara in surprise. His infernal spell circle abruptly collapsed, with all the violence for which that school of magic was famous. The glowing lines, already burned into the ground, began exploding like a series of embedded firecrackers, hurling ash and clumps of sod in all directions and causing Agasti himself to stagger, being caught in the middle of it. Both revenants surged protectively toward him, but Toby was both closer and faster, snatching the warlock and hauling him bodily out of the radius as the circle continued to disintegrate. Trissiny needed no further urging, and her armor, sword, and shield coalesced around her out of pure light. Her aura flared into being, wings and all, pushing outward with an intensity that it rarely showed. Toby’s effort, by comparison, was muted. The glow sprang up around him as well, but for all that it pushed outward nearly as far as Trissiny’s, it was without the same ferocity. His contribution didn’t compare at all to the divine nova he had sometimes unleashed at Omnu’s bidding. Smoke rose from both of them, accompanied by a harsh buzzing in the air, as their channeled power annihilated loose infernal magic from the vicinity. Agasti retreated with a nimbleness that would have been unbelievable when they had first seen him the night before, muttering and gesticulating rapidly with his cane. He charred another spell circle in the ground a few yards distant, then swiftly moved on to cast another while the first formed a smoky vortex above it, channeling infernal radiation into its center to be contained. The warlock carried on laying down grounding circles as quickly as he could, while his two revenant companions hovered protectively near him, unable to approach the paladins due to the light. Between the three of them, they were making headway against the energy bleeding out of that transposed patch of Hell, but that unfortunately was not the worst of their problems. The distortion rising from the ground around the circle was at first glance easy to mistake for heat waves in the sun, at least until it began spreading outward and reached the paladins. Their divine light did nothing at all to disrupt it, but the reverse was not true. Trissiny stumbled as if struck, her aura flickering, and Toby’s was momentarily snuffed out entirely by the disorientation. When it reached the first of Agasti’s grounding circles, the entire glyph disintegrated in a cluster of minor explosions just the way his original spell circle had. Worst of all, where the slow-moving wave crept past, it changed the ground from the mundane meadow to the heat-blasted stone of the hellscape on the other side. Bit by bit, the patch of hellscape was growing, the dimensional swap expanding one foot at a time. It was a very peculiar sight, the surrounding hills and mountainside being erased by what seemed to be a flat plateau. As the effect expanded, structures began to appear, towers and fences seemingly made from gigantic bones encircling the temple site. None of that commanded their attention, however, as the demons shimmered into being starting when the growing circle had stretched only a few yards out. More and more came as it spread; though the five of them, revenants included, had not been shifted into Hell when the dimensional ripple washed over them, the beings on the other side had evidently been preparing for exactly this. Trissiny, ever the tactician, immediately charged at one of the figures standing in a glowing glyph carved into the ground and chanting with his hands upraised. A guard of five demons surrounding him surged to meet her, and proved no match; they actually burst into flames on contact with her aura, and she only bothered to dispatch the one which was bodily in her way before ramming her sword to its hilt in the chest of the summoner. At no point had he paused in his working, and died as his flesh burned away and dissolved into charcoal from the spot where she impaled him. That drew the attention of the others. The creatures surrounded them by the dozens, brandishing weapons made of bone and in a few cases hurling balls of explosive fire. They were a little bigger than human-sized on average, covered in chitinous scales and plates of natural armor, and wearing nothing but hide loincloths. The entire throng was clearly standing by, ready for battle, with casters positioned evenly around the circle where the temple had stood, chanting and obviously causing the dimensional effect to continue expanding. Nearly a dozen converged on Trissiny, doing nothing but slowing her as she pivoted and tried to make for the next caster. For all their preparedness, this group was clearly not ready to contend with something like a paladin. Agasti, doubtless the first to discern the pattern, felled two more casters in rapid succession with precise shadowbolts, but then had to defend himself from a massed counter-attack with waves of fire and kinetic force. His efforts were supported by blasts of lightning; Kami had retrieved a battlestaff from the carriage and Arakady drew two wands from within his coat, both stepping up beside their patron to fire arcane destruction into all who threatened him. In the sudden furor, none of them even noticed that Toby was simply standing, surrounded by a shimmering glow, and staring. “So. This is your doing.” The air was filled with screams and spellfire; no one heard his soft voice. The light that erupted from the Hand of Omnu was nothing like the steady expansion of the halo which had heralded his divine nova in the past. It burst out in a violent shockwave, the force of it knocking every demon in the vicinity to the ground, most shrieking in pain and several catching fire. It did not have the pure intensity of Omnu’s nova, either; that would simply have incinerated them. Arkady and Kami had also fallen at the first impact, and now Agasti seized each of them by one arm and in a swift swell of shadow, all three vanished. Trissiny had been rocked slightly by the force of the divine spell Toby unleashed, but it did not hit here with anything like the impact it inflicted on their attackers. She pivoted on one heel to face him, then froze. Toby wasn’t looking at her; she could not tell where he was looking. His eyes were completely obscured, emitting a golden glow with an intensity like the sun’s. The demons were already rallying, even despite their obvious pain at the haze of divine energy now covering the site. At least the expansion of the piece of Hell had stopped, every remaining caster having been felled by the blow. In fact, it began to retreat again, the blasted ground giving way to tallgrass and wildflowers which were already wilted by their momentary trip to Hell. Before any could launch another coordinated attack, shapes appeared in the air around them. Scythes, hovering unassisted, seven of them. Barely had they manifested before they began moving. Trissiny hurled herself flat to the ground, covering her head with her shield and leaving her defensive aura alight, but none of the blades struck her. Instead, directed with uncanny aim, they swept through the horde. Wherever a demon was cut, it instantly exploded, leaving nothing but ash upon the wind. Trissiny raised her head warily. Smoke and ashes drifted on the air around them; Toby’s aura flickered as the circle walling off this patch from its home dimension passed back over him in shrinking. It did not dissipate this time, though. The golden scythes now drifted slowly around them, tumbling end over end as they orbited the Hand of Omnu. They had cut down even the bone structures, leaving only shattered and charred fragments to vanish back into Hell as the circle shrank. The very air sang, filled with a tone like distant bells. Trissiny stood, leaving her sword and shield lying on the charred ground behind her. The original patch of Hell remained, a hardened circle of ground where the temple had been, but the dimensional ripple seemed to be fully dispelled now. She strode right up to Toby, pulling off her silver gauntlets and also letting them drop. She took her fellow paladin’s face in both hands. He was standing like one of the stone figures of Salyrene, staring with empty glowing eyes at some nothing in the infinite distance. He did not resist, however, as she tugged his head gently down to face her. It was like staring into a furnace. There was nothing behind his eyes but the light. Not a flicker of expression or acknowledgment on his features. She squeezed lightly, shifting her hands to slowly brush her thumbs across his eyes. Enough mortal reflex remained despite whatever trance he was in that they closed, cutting out the light which blazed onto her own face. Trissiny changed her grip again, releasing his face and pulling him closer. She wrapped an arm around his back and tugged his head down to rest it against her shoulder. The distant music of the Light faded. Golden scythes dissolved into sparks and swirls of unfocused energy. The glow which hung over the whole scene like fog dissipated, giving way to simple, wholesome sunlight. With its passing, Toby seemed to come back to life. His breath caught, came unevenly in little bursts for a moment, and then faltered entirely into shuddering gasps. Weakly, he clutched at Trissiny, and she just held onto him, holding him up even as his legs failed. “You did this on purpose,” Ariel accused as soon as things settled down somewhat. Gabriel took his time before bothering to reply, turning in a circle to make sure there were no more enemies waiting. A few had lunged at him before being swept away in that ripple their chanters were creating; the four who had jumped the wand now lay dead nearby, three little more than skeletons decorated with parchment-like scraps of old skin, all that the scythe had left of them. The fourth was more well-preserved, having been impaled through the heart by Ariel, whom he now plucked from the air. They had spent quite a bit of time on the charms that enabled her to float and fight independently; this wasn’t the field test he would have preferred, but at least it had worked. When the demons began vanishing and an expanding patch of real-world ground appeared in their stead, he had immediately realized what they were doing and what it probably meant for the mortal plane. Gabriel had failed to think of any countermeasure in time, but fortunately, it proved moot; in only moments, the circle had shrunk right back to its original boundaries, and not only was every last demon gone, most of their bone structures had been shattered. Bless Toby and his holy nova. The less uplifting news was that with no control over whatever magic the demons had used to create that effect, he and his friends were still stuck on opposite sides of the dimensional divide. Which was good for them, but his own situation was less cheery. “I’m morbidly curious how you came to that conclusion,” Gabriel finally answered, sliding Ariel back into her sheath and turning another slow revolution to take a more careful look at his surroundings. The geography sort of mirrored that of the real world; there was a towering mountain range to the east, but unlike the Wyrnrange this appeared to be entirely made of gigantic shards of obsidian, and the fires of volcanic eruptions flickered in their heights. Gabe wasn’t well-versed in geology but he had a feeling that wasn’t right; then again, there was no reason to assume the basics of mortal life were applicable here. For example, the forest which spread to the north and south of the flat area in which he stood consisted of trees that seemed to be entirely thorns, some people-sized (and slowly oscillating as if seeking prey) and swaying tree-sized mushrooms whose conical caps contained giant, tooth-lined mouths. As he watched, one snapped at something flying past. “I get no respect,” he muttered, and pulled the stopper. The bottle instantly unfolded itself like a peeled banana, its glass surface vanishing to leave him holding a chunk of crimson crystal. The most confusing part of this experience was that the crystal was significantly larger than the bottle had been. The thing itself he recognized, having seen it quite recently. Something thankfully in the distance screamed. A gust of wind surged up, ruffling his coat and carrying the acrid stink of sulfur. “Please tell me this is inappropriately-timed humor,” Ariel said flatly. “You know what they say about assuming,” he muttered, but knelt to place the soul prison on the ground, then hefted his scythe. A saber wasn’t the ideal tool for breaking rocks; at the blow, the prison bounced away sideways. He did succeed in cracking it, however, and apparently that was all it took. The crack spread, emitting white light, and with a disproportionately violent bang the crystal exploded. Gabriel staggered back, throwing up an arm over his eyes, but there were no fragments. Just a shower of sparks and a tremendous billow of smoke, which quickly drifted away in the breeze. When it was gone, standing where the ruby had landed, there was a demon. She had emerged with her back to him, and her head twisted this way and that as she peered about, causing the waves of purplish hair cascading down her spine to shift and shimmer. The demon wore a surprisingly modest dress, in deep green cloth with wide sleeves and blue embroidery at its hems; it fell to ankle level, revealing cloven hooves and the swaying tip of a prehensile tail. She was taller than he, quite slender of build. For some reason, the sight of her put Gabriel in mind of a gazelle, despite the deep crimson color of her skin. She whirled around, catching herself at the sight of him, and Gabriel again took a wary step back. He carefully kept Ariel lowered, the sword not in a threatening posture. For a moment, he and the demon studied each other. Like Elspeth, she had a bony crest rising from her forehead and making her hair almost invisible from the front. Her eyes were yellow, rather like a wolf’s. Aside from that and the red skin, her fine, narrow features would not have looked out of place on most of the people he’d known growing up in Tiraas. Xyraadi wrinkled her nose at him, her upper lip curling in a pained expression. She took two mincing steps back on her dainty hooves and closed her eyes, raising both hands with the palms extended to the sides. Flickering lights rose in a circle around her. Khelminash had no eyebrows, save for bony ridges above their eyes which did not move. Xyraadi managed to look incredulous regardless, but the expression faded as he recounted, as efficiently as possible, his journey with the others on Vesk’s instructions, finishing with their current predicament. When he trailed to a stop, she was silent for a moment, digesting it. She flinched. Only slightly, but it was enough to make him wince in sympathy. Xyraadi turned, staring out toward the west where the horizon was lost in a yellowish smoggy haze. “That tends to make people on the other side pretty mad,” he noted. A sound split the air, a terrible sound seared into his memory. It was like a hiss, if a hiss was a bellow; a strangely subtle noise which occurred only on the very edges of hearing, and yet was powerful enough to make the ground vibrate. A shape appeared high overhead from the sulfurous clouds roiling above the obsidian volcanoes, a languidly undulating silhouette in the murk that resembled an eel. It was a small shadow, but Gabriel knew from experience that that only meant it was far away. He remembered very well how big they were. If the ability to evade questions was a characteristic of a good lawyer, Mortimer Agasti must have been a very good one indeed. Not that he was anything less than a perfectly gracious host. Agasti put them up in his own apartment for the night; it proved quite luxurious, though there were only two guest rooms and Toby and Gabriel had to share. The warlock was most apologetic about this until they reassured him that this was their customary arrangement back in Last Rock. At some point while no one was looking, Verniselle and Izara both absented themselves without fanfare or farewell, in the customarily inscrutable manner of deities. None of the paladins enlightened Agasti as to his friend Nell’s true nature, since obviously she would have herself had she ever intended to. From then on, aside from the revenant Arkady, it was just them and Agasti. Over a sumptuous dinner, over dessert and tea afterward, at breakfast the next day and then during the long carriage ride to the north and east out of Ninkabi, he kept up a vivacious conversation with them, somehow constantly turning any query into his own history back upon them. Their quest thus far, as Vesk had ordained it, was related by the time dinner was done, with Agasti sharing an insightful back-and-forth with them about the nuances of the various gods and cults they’d encountered over tea afterward. He kept up his inquiries after that into the next day, though. Never pressing and always retreating politely at the first sign of hesitation, but just as constantly deflecting any subject from himself and back to them. Over the passing hours they ended up describing a lot of life in Last Rock, relating stories of their various adventures under Tellwyrn’s tutelage, and even reminiscing about their respective upbringings in Tiraas and Viridill. As the hours drifted by in pleasant talk, even Trissiny began to forget her initial wariness. Agasti himself seemed to be growing younger right in front of them; energy began to fill his voice and movements, his steps lost their shuffle, and even his posture straightened up. It was as if the man were drawing a new enthusiasm for life simply from their presence. “And yet, here you still are,” Toby said in his mild tone, giving her a smile. “Someone mentioned that to us,” Toby noted. “Not much of one, yet,” Gabriel demurred. “Shut up, Ariel,” Gabe sighed. “We’d be glad of your advice,” Toby replied. “You’ve been extremely insightful so far.” The others nodded agreement. “But that’s Themynrite technique, isn’t it?” Trissiny objected. “That sounds like a quick way to completely destroy someone’s sanity,” Toby said, eyes wide. The carriage veered slightly, leaving the road to park beside it, and came to a halt. They clambered out into the sunshine, and the old man was not the only one who moved stiffly after that long confinement; it had been a good two hours’ drive from Ninkabi. Both the revenants who had accompanied them stepped out of the driver’s compartment, moving smoothly and without hesitation. Evidently there were benefits to the lack of a mortal body. Patchy stands of trees covered the rolling foothills of the Wyrnrange on this side, casting intermittent shade. They had come to the very foot of the mountains, or one long outcropping of them at least; the entire West sloped down from the Wyrnrange to the sea, and N’Jendo was mostly rocky country where steppes and jagged peaks cropped up all the way to the coast, and beyond it in the form of islands. Here there was a little glade, tucked into the shadow of a mountain and braced between two steep hills, each crowned with trees. In the shade between them sat a disused temple. It was of a style common to old-fashioned Avenist and Izarite architecture, a round structure of granite with a domed roof, braced by columns. The temple was obviously abandoned, the path up to its doors overgrown, the doors themselves hanging open and one listing crazily off its hinges. What had once been a garden out front was now a wild tangle of bushes, flowers, and small trees, and climbing vines had covered half the structure. For all that, though, it seemed to be in good repair, the broken door notwithstanding. The stone was not broken or even cracked, at least not visibly. “It all seems so peaceful,” Gabriel said, taking a step forward. Silence fell; even the singing of the cicadas was distant. Apparently the insects were not inclined to approach this place. Arkady came to stand behind Agasti’s shoulder, folding his hands behind his back, while Kami continued unpacking a picnic lunch from the carriage. “So what happens if we remove it?” Trissiny demanded. “At least, not till we yank out the linchpin holding it all together,” Gabriel interjected. “Brute force is rarely the best solution to any problem,” said Toby. The plan involved a great deal of tense waiting, from their side. Agasti sat cross-legged in the center of a sprawling ritual circle, his cane driven into the ground in front of him and his eyes fixed on the orb at its head. Flickers of flame extended forward from the subtly glowing glyphs and lines surrounding him, outlining the path into the temple Gabriel had taken. Unlike arcane and fae circles, which were inscribed with charged materials, he had simply burned the pattern right into the ground. Both revenants hung back, at the warlock’s orders, hovering about the carriage. They clearly didn’t like leaving him alone, but he had insisted that the proximity of more demons would imperil the extremely delicate balance he and Gabriel had to maintain. Toby kept a balance of his own standing upright with his hands folded behind him, gazing blank-faced at the temple. It was an aspect that might have appeared callous and disinterested to an observer who did not recognize meditative practice in action. Trissiny, who was also schooled in meditation, preferred to pace. “Do you sense anything?” she asked, her course bringing her up behind Toby. She drew in a deep breath, nodded, and resumed pacing. “Yeah, I feel real useful out here,” she muttered. “I hear that,” she replied fervently. The wind picked up faintly, hardly enough to disturb her hair; just the slightest whisper of breath, as if to emphasize the silence which fell. There was nothing said for a time, and they both stared at the temple, waiting. “My conscience,” she said suddenly in the quiet, and Toby finally broke his poise, turning to her with a look of surprise. “Here it is,” Trissiny growled, extending her arm. She bared her teeth in a snarl at the unfairness of it all, but nodded. “What is happening?” Trissiny demanded. “GABRIEL!” Toby roared, projecting powerfully from the diaphragm. Trissiny actually charged forward, ignoring Agasti’s warning. As she came abreast of the place where the fire-tracks from the spell circle petered out, however, her divine shield flared alight unbidden, sparking and putting off a corona as if it were under attack from all sides. Trissiny herself slammed to a stop, staggering backward. Gabe appeared in the temple’s broken door, his coat flaring behind him as he pelted full tilt toward them. Barely had he crossed the threshold, however, when the entire world flipped. From a mortal perspective, it was a powerfully confusing thing to behold. That one fragment of creation changed in a way that called to mind a thing being turned upside-down, or backward, or perhaps inside-out. What actually moved, however, didn’t move at all physically, but simply transposed itself with a piece of…something else. Just being close enough to observe it brought waves of vertigo. But whatever the phenomenon, the result was obvious. When the effect collapsed, the dimensions had re-aligned, but instead of the meadow and the temple, they were now staring at a patch of hard reddish stone, marred by outcroppings of jagged obsidian. The mortal and infernal planes had separated, all right, but in that place where they had been merged, each piece was now on the wrong side. He skidded to a stop, tucking the mithril fragment into his pocket and raising the scythe in his other hand. Beyond the little meadow, where the world had once been, there was now a blasted scape of stone, thorns, and towers of what looked like bone. The sky was a sulfurous yellow, and the air, notably hotter than even the Jendi summer afternoon, stank of brimstone. More immediately, standing all around the circle in which the forsaken temple stood, were demons. Dozens of them, all staring hungrily at him. The Hand of Vidius braced his feet, hefted his scythe, and readied himself for whatever came next. “They expect us to step into that?” Trissiny demanded, stopping just inside the club’s door. “More important?” Trissiny muttered, but began gingerly descending the stairs into the mist. The main floor of Second Chances was sunken, with the entrance and the bar area five steps up and the stage taller than that. It was a neat layout, the stage along the left side of the big room from the door and the bar to the right, with a clear space in front of the stage itself presumably for dancing and marked off from the tables which occupied the rest of the floor by a ring of comfortable couches and chairs. The entire floor area was covered by gently swirling mist which looked to be about two feet deep. That would simply be mysterious and pretty, if not for the sullen flashes of orange light which flickered through it from time to time, hinting at submerged hellfire. At this early hour it was relatively quiet in the club, with a few musicians playing a peculiar syncopated tune on the stage, a lone bartender and a single waitress on duty on the floor, and only a handful of other patrons. The cluster who had been waiting outside were more than half the occupants, now sitting together at a table opposite the floor from the entrance. All employees of Second Chances, from the serving staff to the musicians to the burly sleeveless man standing just inside the door, were revenant demons. She directed them to a table tucked away in the space to the left of the entry stairs and the right of the stage, with a decent view of both. Nell was the first there, largely because Trissiny and Toby were stepping with uncertain care through the mist and Gabriel kept slowing almost to a stop, gazing in apparent wonder at the musicians. By the time they had arrived, she had already seated herself and was lounging back in the wrought iron chair wearing an amused little smile. The waitress manifested at their table almost the moment they seated themselves, a young woman with blunt little horns and facial features that looked like they might have been of local Jendi stock. It was hard to tell, between her oddly marbled skin and hollow skull full of flame. “Nell, I haven’t seen you in the longest,” she said with a smile, flickers of orange light visible between her silvery teeth. “And these must be the special guests! Welcome to Second Chances, my lords and lady. I hope you’re not here looking for trouble?” The edge of fear in her tone and bearing were only just discernible. “If there’s to be trouble, it won’t be us starting it,” Trissiny added. “What do you have that’s not alcoholic?” Toby asked. “Thanks, but none of us drink,” he replied. Trissiny turned to him, raising her eyebrows in surprise. Nell cleared her throat loudly, putting on a theatrical frown. The demon turned and swished away in a trail of disturbed mist, all three paladins gazing thoughtfully after her. A short, grim pause fell. Toby shifted in his seat to glance around at each of the revenants in the room. “By enslaving their souls?” Trissiny asked evenly. Toby and Gabriel both gave her wary looks; a year ago she would have delivered that line at the top of her lungs, probably with sword already in hand, but now she just sat there, apparently calm. “Uh…citizenship has classes?” Gabriel demanded, straightening up in his chair. “I’ve never even heard of that,” he said, looking shaken. “So…they’re not forced to work here?” Trissiny asked. “Well…that’s fair,” Trissiny replied, a trifle grudgingly. Kami returned before any further argument could be offered, bearing a tray with three glasses, a pitcher, and a cocktail, which she began laying out on the table. “That was me,” Toby informed him. “It must flow,” Nell said solemnly. “Nobody needs someone to hate,” Toby said with pure weariness. She paused, grimaced, and tossed back the rest of her drink. Smoke poured from her mouth for a few moments as she continued speaking. Nell paused again, glancing regretfully down at her empty glass. Soft jazz played over the chilling silence which descended, clashing with the mood. Nell met each of their eyes in turn before continuing. “Mortimer taught his little girl well. It takes a hell of a warlock, pun intended, to take out multiple fae casters, but Maehe hit the wavespeakers first. She let the children escape on a boat to the next clan’s island, but destroyed every other craft that tried to flee. It took her a whole day to slaughter every last member of her clan, and char the island itself so completely that its beaches were molten glass and not a thing still grew there. Apparently she was very patient and methodical about the whole thing. At any rate, she had just finished up when the Empire deployed a strike team to deal with the renegade warlock. Slowly, she leaned forward, pushing aside her glass to rest her elbows on the table and stare firmly at them. “We will do our best to shield him from any,” Toby promised. Trissiny and Gabriel nodded mutely in agreement. In the quiet which descended, they were approached by another revenant who cut a wake through the mist of the club. He was tall, lean of build, and walked with the grace of a martial artist, his skull surmounted by horns longer than any of the others they had seen, and branching twice almost like antlers. Though the man’s features were set in a cold expression, he bowed quite diffidently upon stopping at their table.